Situated around 27 kilometres from Billund, the town of Jelling is a small, picturesque place. It is famous for its Jelling Monuments. The Jelling Monuments are basically archaeological findingshaving unique historical testimony and designwhich date back to the 10th century. 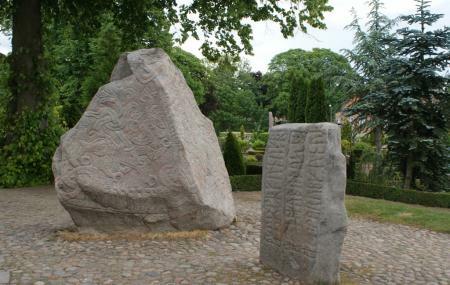 Due to the place of discovery of these rune stones, it is said that Denmark was born in Jelling. The stones are fondly called ‘Denmark’s birth certificate’! There are plans of moving the stones into a nearby museum. This might take place in early 2016. How popular is The Jelling Monuments? People normally club together Givskud Zoo and The City Park while planning their visit to The Jelling Monuments. If you're at all interested in history, this place is definitely worth a visit. Don't forget to save time for the exciting (free!) museum as well. Don't miss the museum right across the church. The stones are worth a fast visit but the museum tells a lot of history in a very interactive way. One of the most important historic places in Denmark. Don't miss out on the free museum across the road. Also take a walk around the scenery and see if all from different angels. The history of the stones are very interesting, and really should be studied prior to coming to get the real historic feel. A bunch of good options to get a bite to eat next to the place and in the museum as well. Fairly easy parking. Should not a be a problem off season. Wonderful scenery and culturally rich area. Monument is magnificent and local museum a must visit.